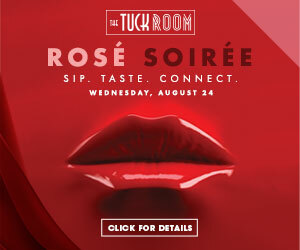 The Tuck Room, a North Miami Beach drinking den and gastro lounge presenting bold flavors and relaxed atmosphere, invites guests to sip, taste and connect Wednesday, August 24, at their third-monthly Rosé Soirée presented by Piper-Heidsieck Champagne, the official Champagne of the Oscars and Marilyn Monroe’s favorite bubbly. 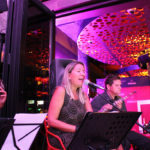 Corks will be popping as The Tuck Room opens its expansive patio bar for their Rosé Soirée featuring flowing Champagne, passed appetizers and a live Bossa Nova DJ. 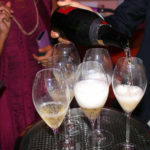 For $40 per person—$28 for iPic Theaters Sapphire members (anyone is free to sign up at www.ipicmember.com)—guests will receive two glasses of Piper-Heidsieck Champagne along with an exclusive Sacre Sauvage cocktail for the evening and a bounty of Tuck’s shared plates to indulge in during the festivities. Prepare to see red when Tuck’s bartenders whip up the night’s signature cocktail using fresh berries and citrus bitters, topping it off with Piper-Heidsieck Rosé Champagne. Passed appetizers include The Tuck Room’s famed menu items alongside dishes specially crafted for the evening, which ends on a sweet note with a decadent Champagne-infused dessert. Guests can grab a glass and strike a pose in the Piper-Heidsieck photo booth pesquisa feita pelo site médico dr. ed complete with festive props and a professional photographer to capture every moment of the night. 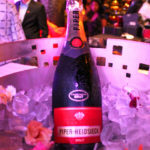 Be sure to wear red for a chance to take home a bottle of Piper-Heidsieck Rare 2002 Champagne before the festivities end! 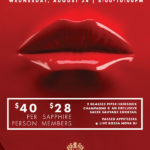 The soirée starts Wednesday, August 24 from 8-10 p.m.
An intimate and chic drinking den and gastro lounge, The Tuck Room offers guests a seductive culinary and beverage escape. Under the direction of VP of Culinary and three-time James Beard Award winner chef Sherry Yard and Corporate Sommelier/Executive Bartender Adam Seger, guests can enjoy an extensive menu of sharable plates and handcrafted cocktails. The Tuck Room is tucked away inside iPic Theaters, located at 3701 NE 163rd Street at the Intracoastal Mall in North Miami Beach. 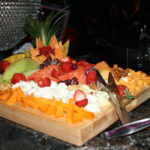 For reservations or more information visit, www.thetuckroom.com or call 786-563-7061. For more information on iPic Theaters North Miami Beach, please visit www.iPic.com. Follow us on Instagram at https://www.instagram.com/iPictheaters/, Facebook at www.facebook.com/iPictheaters and Twitter at www.twitter.com/iPictheaters.